Arkansas, nicknamed the Land of Opportunity or The Natural State, is a state in the United States of America. Its capital and largest city is Little Rock. It has been estimated by the U.S. Census Bureau in 2015 that around 2,978,204 people live in Arkansas. 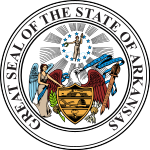 Arkansas became the 25th state to enter the Union in 1836. During the American Civil War, Arkansas was one of the Confederate states, however, it was the second state to be put back in to the U.S. in the Reconstruction. View from the summit of Petit Jean Mountain, in the Arkansas River Valley, from Mather Lodge in Petit Jean State Park. The Ouachita River runs through the Ouachita National Forest. Blanchard Springs Caverns in Stone County is a popular tourist destination. The Buffalo National River, one of many attractions that give the state's nickname The Natural State. Arkansas borders Louisiana to the south, Texas to the southwest, Oklahoma to the west, Missouri to the north, and Tennessee and Mississippi on the east. 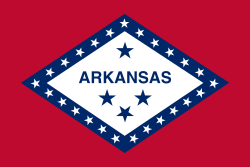 The United States Census Bureau classifies Arkansas as a southern state. The Mississippi River forms most of Arkansas's eastern border, except in Clay and Greene counties. There the St. Francis River forms the western boundary of the Missouri Bootheel. Arkansas has many rivers, lakes, and reservoirs. Arkansas has few natural lakes but many reservoirs such as Bull Shoals Lake, Lake Ouachita, Greers Ferry Lake, Millwood Lake, Beaver Lake, Norfork Lake, DeGray Lake, and Lake Conway. Arkansas is home to many caves, such as Blanchard Springs Caverns. More than 43,000 Native American living, hunting and tool making sites have been catalogued by the State Archeologist. Arkansas is currently the only U.S. state in which diamonds are mined. This is done by members of the public with primitive digging tools for a small daily fee, not by commercial interests. Arkansas is home to a bunch of Wilderness Areas totaling around 150,000 acres (610 km2). These areas are set aside for outdoor recreation and are open to hunting, fishing, hiking, and camping. No vehicles are allowed in these areas. Arkansas, like most other Southern states, is part of the Bible Belt. It is mostly Protestant. The largest denominations by number of followers in 2000 were the Southern Baptist Convention with 665,307; the United Methodist Church with 179,383; the Roman Catholic Church with 115,967; and the American Baptist Association with 115,916. Arkansas has two university systems: Arkansas State University System and University of Arkansas System. Some other public institutions are Arkansas Tech University, Henderson State University, Southern Arkansas University, and University of Central Arkansas. It is also home to 11 private colleges and universities. One of them being Hendrix College, one of the nation's top 100 liberal arts colleges, according to U.S. News & World Report. Arkansas is notable for its bauxite mines. Arkansas was also the first U.S. state where diamonds were found. Notable Arkansans include Bill Clinton, who was governor of Arkansas before he became the President of the United States, and Sam Walton, the founder of Wal-Mart. ↑ "Mag". NGS data sheet. U.S. National Geodetic Survey. http://www.ngs.noaa.gov/cgi-bin/ds_mark.prl?PidBox=FG1888. Retrieved October 20, 2011. ↑ 4.0 4.1 "Elevations and Distances in the United States". United States Geological Survey. 2001. Archived from the original on October 15, 2011. Retrieved October 21, 2011. ↑ [[[:Template:GNIS 3]] "Magazine Mountain"] Check |url= value (help). Geographic Names Information System. United States Geological Survey. Retrieved January 2, 2013. ↑ [[[:Template:GNIS 3]] "Signal Hill"] Check |url= value (help). Geographic Names Information System. United States Geological Survey. Retrieved January 2, 2013. ↑ ""Table 1. Annual Estimates of the Resident Population for the United States, Regions, States, and Puerto Rico: April 1, 2010 to July 1, 2015" (CSV). U.S. Census Bureau". ↑ Smith, Richard M. (1989). The Atlas of Arkansas. The University of Arkansas Press. p. 25. ISBN 978-1-55728-047-3. ↑ "The Association of Religion Data Archives | Maps & Reports". Thearda.com. Retrieved July 30, 2010. ↑ "National Liberal Arts College Rankings". U.S. News & World Report. 2012. Retrieved September 3, 2012. This page was last changed on 5 April 2019, at 14:01.